Lovely Bondville sponsors The Wall Sticker Company have a great promotion running until Tuesday 9th October 2012. 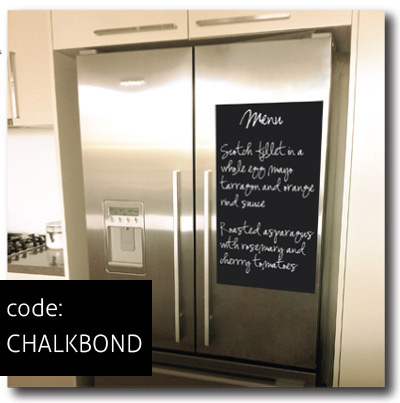 With any purchase from the online store, enter the code CHALKBOND at checkout and receive a free chalkboard wall sticker with your order. How great! The chalkboard sticker is 61 x 35cm and worth $27.50 (for one). The decal would make a fantastic to-do list, menu planner, communication station, or spot to jot a favourite quote. Wipes clean easily with a cloth or sponge. Head over to The Wall Sticker Company to check out their great range of removeable wall decals and wallpaper.